Beyond the work that can be achieved through the larger Canopy Team, there is an opportunity for further progress to be made by redefining and boosting the existing partnership between the City of Charlotte and TreesCharlotte. In broad terms, urban forestry management involves a range of tasks, including pruning, removal, responding to service requests, planting and new tree care, public relations, and education. Currently, the city holds much of the responsibility and full ownership of public trees but lacks the resources to proactively care for them. Most of the city's tree care is reactive (responding to calls for service, emergency care, etc.) Proactive care is critical for public safety, but also to extend the life of the existing tree canopy. As with most financially-strapped cities, the only sustainable way to achieve long-term urban forestry goals is through public/private partnership. Fortunately, Charlotte is already steps ahead with the formation of TreesCharlotte in 2012. However, scope adjustments are needed to more accurately reflect Charlotte's needs. Suggested City Role: With a limited budget, almost 180,000 public trees to care for, and the goal to move towards regular proactive care, planting new trees may not be the most efficient use of city resources. Rather than simply planting new trees, the city should primarily focus resources on caring for the existing canopy. Any existing planting funds should be diverted wholly to maintenance to catch up on the backlog of work and implementation of a maintenance plan, especially for the high-value mature trees. Trees in good condition live longer and generally experience less storm damage, so regular care for existing trees may alleviate (or postpone) some of the anticipated removals of maturing trees as Charlotte's canopy ages. Tree Planting. Nonprofits like TreesCharlotte are well suited to engage the community to plant (or replace) and care for new trees for two reasons. First, raising funds is often easier for tree plantings (versus ongoing tree maintenance). Second, tree planting and establishment programs are appealing to the public (volunteers) and can be done with minimal equipment. By assuming public tree installation responsibilities in concert with the city, TreesCharlotte can free the city to focus on catch up maintenance tasks for the existing public tree canopy. Young Tree Care. A young tree care program during the first three years of tree establishment could also be spearheaded by TreesCharlotte. There are many different tree steward programs across the country today, including youth employment programs like Indianapolis' Youth Tree Team (YTT) program (see the case study below). After the establishment period, trees can then be folded into the city's existing proactive multi-year pruning cycle. Neighborhood Engagement. By spearheading public tree planting campaigns, TreesCharlotte would also put itself in a pivotal position to get neighborhoods engaged, which has been identified in this plan as critical to future success. TreesCharlotte has shown time and again how effective it has been in recruiting community volunteers, fundraising, and engaging and educating the public in tree planting campaigns. This role is well suited to the organization's strengths. See an example of how these newly defined roles for both the city and TreesCharlotte could work in concert annually. Summarize the existing partnership between TreesCharlotte and the city. Describe proposed changes to partnership. Set a meeting with the two partners to review the existing and proposed partnership plan together. Convey this change (proposed or official) at the first Canopy Team meeting to collect input. Review any official changes required (if needed) to officially enact partnership changes (charter, bylaws, etc.). Potential Owner: City of Charlotte (City Arborist, City Tree Canopy Manager) & TreesCharlotte. 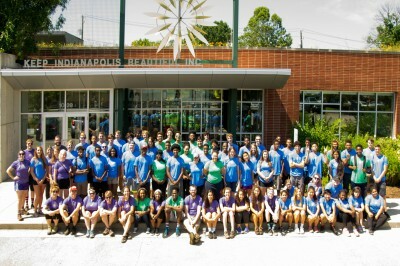 Case Study: Combining Youth Employment Opportunities with New Tree Care in Indianapolis. Newly planted public trees in Indianapolis don't always have predetermined caretakers, so Keep Indianapolis Beautiful (the city's nonprofit tree partner) employs a team of youth to serve the role of needed new tree establishment and care. The Youth Tree Team (YTT) program, which began in 2008, pays local high school students to water, mulch, prune, stake, and plant public trees for seven weeks each summer. The program is supported through general funding sources (corporate, foundation) and other donations. Learn more about KIB's Youth Tree Team. Next Action Step: Neighborhood Engagement.